John Kelly’s current version of Joni Mitchell, on view at Joe’s Pub, is stripped-down—not officially drag, yet still bearing traces of his earlier incarnations of the character, which featured a wig and costume. This Joni is John in simple clothes, on guitar, supported by pianist and music director Zecca Esquibel. Listening to him, I was brought back to my own Joni-obsessed years as a teenager, learning those albums by heart and reaching up for her high notes. Kelly evokes that kind of personal connection on the stage, evidencing years of care for the music. Kelly is more of a performance artist than a straight-ahead singer. 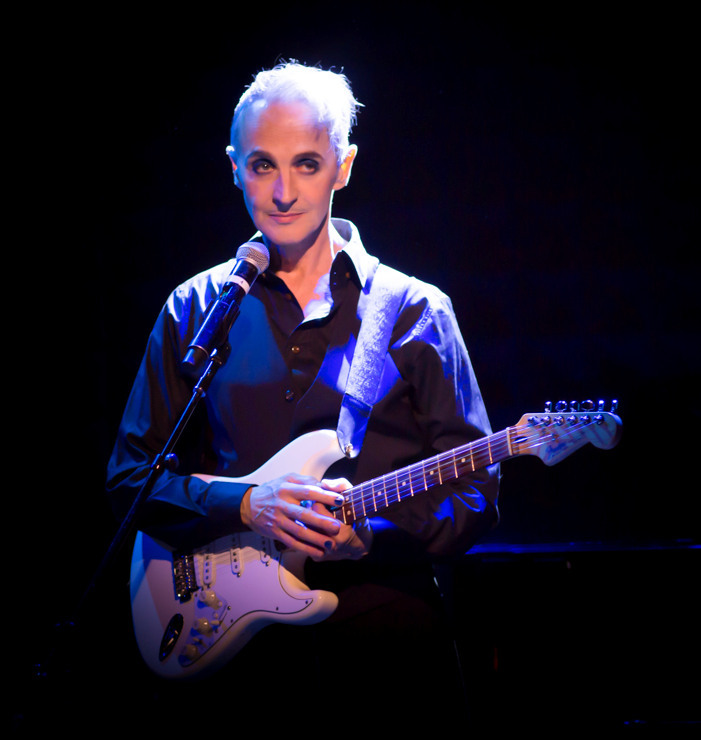 With over thirty years of award-winning work in theatre, dance, music, writing, and visual art, he’s been presented at some of the best performance and gallery venues in the U.S. and Europe; when not tackling Joni Mitchell, he’s done character studies of such lightweights as Jean Cocteau and Antonin Artaud. The magic of performance artists is often in their presence; where this show shines is when Kelly brings us with him to share a state of mind, create a happening, and give us a chance to see an artist of depth and substance really work and live in the moment. Kelly’s qualities give the show its inner life, but—and maybe this is intentional—musically it is a little raw. It’s difficult music to play, with Kelly up at the top of his fret board navigating Mitchell’s ambitious chord changes and likely singing most of the songs in their original keys; he has his work cut out for him. When Kelly’s very high falsetto hits its stride, it is magical and ethereal—you can see why he might create entire evenings around a character that uses that sound; but at other times, it sounds like a strain. As an audience member, I wished for him more moments of ease where he could settle into a lower register. His patter sounds largely unscripted: the story of the ups and downs in his own connection with Joni over the years, as well as moments of his openly looking for reassurance from the audience, all delivered as spontaneous and honest. This contributes to the raw and vulnerable texture of the evening. His audience absolutely adored him and supported him throughout. For people who are not already in a relationship with either his work or Mitchell’s, it would be useful to have a few more points of entry to understand her legacy and the context of her body of work, and what brought him to it. Down to You, the show’s title song, is an apt choice, evoking the more simple and personal nature of the evening. Those opening lyrics, “Everything comes and goes / marked by lovers and styles of clothes,” brings the passage of time and the process of loss and redefining the self into sharp relief. Also from the album Court and Spark, “People’s Parties” / “Same Situation” continues the theme of laying bare our habits, shortcomings, and hypocrisies. “Woodstock” has been so famously covered by other artists, that people often forget that Mitchell wrote it; with an arrangement of brooding, sustained intensity, Kelly’s cover is a real standout. From Mitchell’s Hejira album, “Amelia,” drawn from her ’70s jazz period working with bassist Jaco Pastorius, is stylistically unique in this show; Kelly performs it with beautiful attention to the lyrics with their recurring images of flying. “Michael from Mountains,” from her 1968 debut album, Song to a Seagull, is from a more innocent time; Kelly brings Mitchell’s young ringing soprano to life, and delicately handles the magical first moments of a hippie love story.